Createspace Independent Publishing Platform, 9781453719657, 194pp. The Tale of Miss Berta London is for any young audience who encounters difficulties in school, home-life or any other case for that matter. This book can be for anyone who needs to be uplifted in times of hardship. The main purpose of this book is to uplift and inspire children and young adults. Miss Berta's character is one many young readers can see as a mentor. She goes through a variety of journeys and has come a long way from top fashion editor, to a well-respected humanitarian for the youth. I strongly feel that it is important to circulate positive books for the youth, to give them a sense of conviction that they can achieve anything they put their minds to, regardless of the case or situation. I wanted my first book to target the youth because the future lies in their hands. Berta's days as fashion editor were not what she expected. Her mother was a fashion icon. Therefore, she felt it was her duty to live her mother's legacy and be a fashion mogul. Miss Berta learns a hard lesson: life is more than the material world. She hits rock bottom and has no choice, but to become a nanny for a rich family, the Williamson's. She has to adapt to this social class. This new job she receives as nanny makes her a grounded person and she uses these new skills to create a magazine, that will bring families closer together. She serves her purpose as a mentor, solving problems for troubled families. 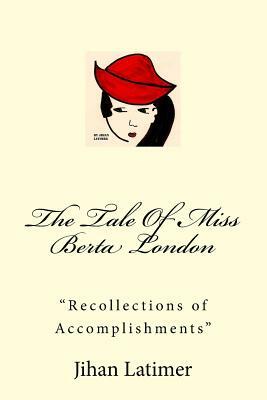 Miss Berta London is a character, who becomes appreciated by all, once given the chance. Jihan Latimer is an inspirational writer who has always taken a passion for the written word. Ever since grade school she took it upon herself to keep a journal at her side and write whatever she thought; making up her own adventures as she went along. This passion she had for the written word stuck with her throughout life and she feels very blessed and honored to have her first novel published. She has done a great deal of traveling in her lifetime and only wishes to share those experiences with her readers. She was born in Washington D.C but grew up around the world.